^ 2.0 2.1 查錫良 藥立波. 生物化學與分子生物學 第八版. 人民衛生出版社. 2013. ISBN 978-7-117-17214-1. ^ RNA: The Versatile Molecule. University of Utah. 2015. ^ Nucleotides and Nucleic Acids (PDF). University of California, Los Angeles. ^ R.N. Shukla. Analysis of Chromosomes. ISBN 9789384568177. ^ 6.0 6.1 Berg JM, Tymoczko JL, Stryer L. Biochemistry 5th. WH Freeman and Company. 2002: 118–19, 781–808. ISBN 0-7167-4684-0. OCLC 179705944 48055706 59502128. ^ I. Tinoco & C. Bustamante. How RNA folds. J. Mol. Biol. 1999, 293 (2): 271–281. PMID 10550208. doi:10.1006/jmbi.1999.3001. ^ Higgs PG. RNA secondary structure: physical and computational aspects. Quarterly Reviews of Biophysics. 2000, 33 (3): 199–253. PMID 11191843. doi:10.1017/S0033583500003620. ^ Nissen P; Hansen J; Ban N; Moore PB; Steitz TA. The structural basis of ribosome activity in peptide bond synthesis. Science. 2000, 289 (5481): 920–30. Bibcode:2000Sci...289..920N. PMID 10937990. doi:10.1126/science.289.5481.920. ^ 11.0 11.1 薛金星. 中学教材全解 工具版 高中生物必修1 分子与细胞. 陕西人民教育出版社. ISBN 9787545015751. ^ 12.0 12.1 12.2 12.3 12.4 人民教育出版社. 生物1 必修 分子与细胞. ISBN 9787107176708. ^ 14.0 14.1 Lee JC; Gutell RR. Diversity of base-pair conformations and their occurrence in rRNA structure and RNA structural motifs. J. Mol. Biol. 2004, 344 (5): 1225–49. PMID 15561141. doi:10.1016/j.jmb.2004.09.072. ^ Barciszewski J; Frederic B; Clark C. RNA biochemistry and biotechnology. Springer. 1999: 73–87. ISBN 0-7923-5862-7. OCLC 52403776. ^ Salazar M; Fedoroff OY; Miller JM; Ribeiro NS; Reid BR. 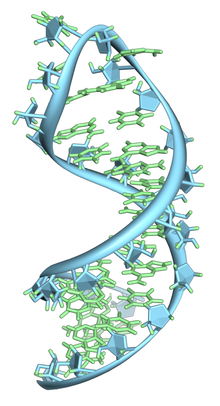 The DNA strand in DNAoRNA hybrid duplexes is neither B-form nor A-form in solution. Biochemistry. 1992, 32 (16): 4207–15. PMID 7682844. doi:10.1021/bi00067a007. ^ Sedova A; Banavali NK. RNA approaches the B-form in stacked single strand dinucleotide contexts. Biopolymers. 2016, 105 (2): 65–82. PMID 26443416. doi:10.1002/bip.22750. ^ Hermann T; Patel DJ. RNA bulges as architectural and recognition motifs. Structure. 2000, 8 (3): R47–R54. PMID 10745015. doi:10.1016/S0969-2126(00)00110-6. ^ Mikkola S; Stenman E; Nurmi K; Yousefi-Salakdeh E; Strömberg R; Lönnberg H. The mechanism of the metal ion promoted cleavage of RNA phosphodiester bonds involves a general acid catalysis by the metal aquo ion on the departure of the leaving group. Perkin transactions 2. 1999, (8): 1619–26. doi:10.1039/a903691a. ^ Jankowski JAZ; Polak JM. Clinical gene analysis and manipulation: Tools, techniques and troubleshooting. Cambridge University Press. 1996: 14. ISBN 0-521-47896-0. OCLC 33838261. ^ Yu Q; Morrow CD. Identification of critical elements in the tRNA acceptor stem and TΨC loop necessary for human immunodeficiency virus type 1 infectivity. J Virol. 2001, 75 (10): 4902–6. PMC 114245. PMID 11312362. doi:10.1128/JVI.75.10.4902-4906.2001. ^ Elliott MS; Trewyn RW. Inosine biosynthesis in transfer RNA by an enzymatic insertion of hypoxanthine. J. Biol. Chem. 1983, 259 (4): 2407–10. PMID 6365911. ^ Cantara, WA; Crain, PF; Rozenski, J; McCloskey, JA; Harris, KA; Zhang, X; Vendeix, FA; Fabris, D; Agris, PF. The RNA Modification Database, RNAMDB: 2011 update. Nucleic Acids Research. January 2011, 39 (Database issue): D195–201. PMC 3013656. PMID 21071406. doi:10.1093/nar/gkq1028. ^ Söll D; RajBhandary U. TRNA: Structure, biosynthesis, and function. ASM Press. 1995: 165. ISBN 1-55581-073-X. OCLC 183036381. ^ Kiss T. Small nucleolar RNA-guided post-transcriptional modification of cellular RNAs. The EMBO Journal. 2001, 20 (14): 3617–22. PMC 125535. PMID 11447102. doi:10.1093/emboj/20.14.3617. ^ King TH; Liu B; McCully RR; Fournier MJ. Ribosome structure and activity are altered in cells lacking snoRNPs that form pseudouridines in the peptidyl transferase center. Molecular Cell. 2002, 11 (2): 425–35. PMID 12620230. doi:10.1016/S1097-2765(03)00040-6. ^ Mathews DH; Disney MD; Childs JL; Schroeder SJ; Zuker M; Turner DH. Incorporating chemical modification constraints into a dynamic programming algorithm for prediction of RNA secondary structure. Proc. Natl. Acad. Sci. USA. 2004, 101 (19): 7287–92. Bibcode:2004PNAS..101.7287M. PMC 409911. PMID 15123812. doi:10.1073/pnas.0401799101. ^ Tan ZJ; Chen SJ. Salt dependence of nucleic acid hairpin stability. Biophys. J. 2008, 95 (2): 738–52. Bibcode:2008BpJ....95..738T. PMC 2440479. PMID 18424500. doi:10.1529/biophysj.108.131524. ^ Vater A; Klussmann S. Turning mirror-image oligonucleotides into drugs: the evolution of Spiegelmer therapeutics. Drug Discovery Today. January 2015, 20 (1): 147–155. PMID 25236655. doi:10.1016/j.drudis.2014.09.004. ^ Nudler E; Gottesman ME. Transcription termination and anti-termination in E. coli. Genes to Cells. 2002, 7 (8): 755–68. PMID 12167155. doi:10.1046/j.1365-2443.2002.00563.x. ^ Jeffrey L Hansen; Alexander M Long; Steve C Schultz. Structure of the RNA-dependent RNA polymerase of poliovirus. Structure. 1997, 5 (8): 1109–22. PMID 9309225. doi:10.1016/S0969-2126(97)00261-X. ^ Ahlquist P. RNA-Dependent RNA Polymerases, Viruses, and RNA Silencing. Science. 2002, 296 (5571): 1270–73. Bibcode:2002Sci...296.1270A. PMID 12016304. doi:10.1126/science.1069132. ^ Wu L, Belasco JG. Let me count the ways: mechanisms of gene regulation by miRNAs and siRNAs. Mol. Cell. January 2008, 29 (1): 1–7. PMID 18206964. doi:10.1016/j.molcel.2007.12.010. ^ Matzke MA, Matzke AJM. Planting the seeds of a new paradigm. PLoS Biology. 2004, 2 (5): e133. PMC 406394. PMID 15138502. doi:10.1371/journal.pbio.0020133. ^ Vazquez F, Vaucheret H, Rajagopalan R, Lepers C, Gasciolli V, Mallory AC, Hilbert J, Bartel DP, Crété P. Endogenous trans-acting siRNAs regulate the accumulation of Arabidopsis mRNAs. Molecular Cell. 2004, 16 (1): 69–79. PMID 15469823. doi:10.1016/j.molcel.2004.09.028. ^ Sontheimer EJ, Carthew RW. Silence from within: endogenous siRNAs and miRNAs. Cell. July 2005, 122 (1): 9–12. PMID 16009127. doi:10.1016/j.cell.2005.06.030. ^ Doran G. RNAi – Is one suffix sufficient?. Journal of RNAi and Gene Silencing. 2007, 3 (1): 217–19. （原始内容存档于2007-07-16）. ^ Pushparaj PN, Aarthi JJ, Kumar SD, Manikandan J. RNAi and RNAa — The Yin and Yang of RNAome. Bioinformation. 2008, 2 (6): 235–7. PMC 2258431. PMID 18317570. doi:10.6026/97320630002235. ^ Horwich MD, Li C Matranga C, Vagin V, Farley G, Wang P, Zamore PD. The Drosophila RNA methyltransferase, DmHen1, modifies germline piRNAs and single-stranded siRNAs in RISC. Current Biology. 2007, 17 (14): 1265–72. PMID 17604629. doi:10.1016/j.cub.2007.06.030. ^ Girard A, Sachidanandam R, Hannon GJ, Carmell MA. A germline-specific class of small RNAs binds mammalian Piwi proteins. Nature. 2006, 442 (7099): 199–202. Bibcode:2006Natur.442..199G. PMID 16751776. doi:10.1038/nature04917. ^ Horvath P, Barrangou R. CRISPR/Cas, the Immune System of Bacteria and Archaea. Science. 2010, 327 (5962): 167–70. Bibcode:2010Sci...327..167H. PMID 20056882. doi:10.1126/science.1179555. ^ Wagner EG, Altuvia S, Romby P. Antisense RNAs in bacteria and their genetic elements. Adv Genet. Advances in Genetics. 2002, 46: 361–98. ISBN 9780120176465. PMID 11931231. doi:10.1016/S0065-2660(02)46013-0. ^ Gilbert SF. Developmental Biology 7th. Sinauer. 2003: 101–3. ISBN 0-87893-258-5. OCLC 154656422 154663147 174530692 177000492 177316159 51544170 54743254 59197768 61404850 66754122. ^ Amaral PP, Mattick JS. Noncoding RNA in development. Mammalian genome : official journal of the International Mammalian Genome Society. October 2008, 19 (7–8): 454–92. PMID 18839252. doi:10.1007/s00335-008-9136-7. ^ Heard E, Mongelard F, Arnaud D, Chureau C, Vourc'h C, Avner P. Human XIST yeast artificial chromosome transgenes show partial X inactivation center function in mouse embryonic stem cells. Proc. Natl. Acad. Sci. USA. 1999, 96 (12): 6841–46. Bibcode:1999PNAS...96.6841H. PMC 22003. PMID 10359800. doi:10.1073/pnas.96.12.6841. ^ Batey RT. Structures of regulatory elements in mRNAs. Curr. Opin. Struct. Biol. 2006, 16 (3): 299–306. PMID 16707260. doi:10.1016/j.sbi.2006.05.001. ^ Scotto L, Assoian RK. A GC-rich domain with bifunctional effects on mRNA and protein levels: implications for control of transforming growth factor beta 1 expression. Mol. Cell. Biol. June 1993, 13 (6): 3588–97. PMC 359828. PMID 8497272. ^ Steitz TA, Steitz JA. A general two-metal-ion mechanism for catalytic RNA. Proc. Natl. Acad. Sci. U.S.A. 1993, 90 (14): 6498–502. Bibcode:1993PNAS...90.6498S. PMC 46959. PMID 8341661. doi:10.1073/pnas.90.14.6498. ^ Wirta W. Mining the transcriptome – methods and applications. Stockholm: School of Biotechnology, Royal Institute of Technology. 2006. ISBN 91-7178-436-5. OCLC 185406288. ^ Xie J, Zhang M, Zhou T, Hua X, Tang L, Wu W. Sno/scaRNAbase: a curated database for small nucleolar RNAs and cajal body-specific RNAs. Nucleic Acids Res. 2007, 35 (Database issue): D183–7. PMC 1669756. PMID 17099227. doi:10.1093/nar/gkl873. ^ Omer AD, Ziesche S, Decatur WA, Fournier MJ, Dennis PP. RNA-modifying machines in archaea. Molecular Microbiology. 2003, 48 (3): 617–29. PMID 12694609. doi:10.1046/j.1365-2958.2003.03483.x. ^ Cavaillé J, Nicoloso M, Bachellerie JP. Targeted ribose methylation of RNA in vivo directed by tailored antisense RNA guides. Nature. 1996, 383 (6602): 732–5. Bibcode:1996Natur.383..732C. PMID 8878486. doi:10.1038/383732a0. ^ Kiss-László Z, Henry Y, Bachellerie JP, Caizergues-Ferrer M, Kiss T. Site-specific ribose methylation of preribosomal RNA: a novel function for small nucleolar RNAs. Cell. 1996, 85 (7): 1077–88. PMID 8674114. doi:10.1016/S0092-8674(00)81308-2. ^ Daròs JA, Elena SF, Flores R. Viroids: an Ariadne's thread into the RNA labyrinth. EMBO Rep. 2006, 7 (6): 593–8. PMC 1479586. PMID 16741503. doi:10.1038/sj.embor.7400706. ^ Kalendar R, Vicient CM, Peleg O, Anamthawat-Jonsson K, Bolshoy A, Schulman AH. Large retrotransposon derivatives: abundant, conserved but nonautonomous retroelements of barley and related genomes. Genetics. 2004, 166 (3): 1437–50. PMC 1470764. PMID 15082561. doi:10.1534/genetics.166.3.1437. ^ Podlevsky JD, Bley CJ, Omana RV, Qi X, Chen JJ. The telomerase database. Nucleic Acids Res. 2008, 36 (Database issue): D339–43. PMC 2238860. PMID 18073191. doi:10.1093/nar/gkm700. ^ Jana S, Chakraborty C, Nandi S, Deb JK. RNA interference: potential therapeutic targets. Appl. Microbiol. Biotechnol. 2004, 65 (6): 649–57. PMID 15372214. doi:10.1007/s00253-004-1732-1. ^ Schultz U, Kaspers B, Staeheli P. The interferon system of non-mammalian vertebrates. Dev. Comp. Immunol. 2004, 28 (5): 499–508. PMID 15062646. doi:10.1016/j.dci.2003.09.009. ^ Dahm R. Friedrich Miescher and the discovery of DNA. Developmental Biology. 2005, 278 (2): 274–88. PMID 15680349. doi:10.1016/j.ydbio.2004.11.028. ^ Caspersson T, Schultz J. Pentose nucleotides in the cytoplasm of growing tissues. Nature. 1939, 143 (3623): 602–3. Bibcode:1939Natur.143..602C. doi:10.1038/143602c0. ^ Ochoa S. Enzymatic synthesis of ribonucleic acid (PDF). Nobel Lecture. 1959. ^ Siebert S. Common sequence structure properties and stable regions in RNA secondary structures (PDF). Dissertation, Albert-Ludwigs-Universität, Freiburg im Breisgau: 1. 2006. （原始内容 (PDF)存档于2012-03-09）. ^ Szathmáry E. The origin of the genetic code: amino acids as cofactors in an RNA world. Trends Genet. 1999, 15 (6): 223–9. PMID 10354582. doi:10.1016/S0168-9525(99)01730-8. ^ Napoli C, Lemieux C, Jorgensen R. Introduction of a chimeric chalcone synthase gene into petunia results in reversible co-suppression of homologous genes in trans. Plant Cell. 1990, 2 (4): 279–89. PMC 159885. PMID 12354959. doi:10.1105/tpc.2.4.279. ^ Dafny-Yelin M, Chung SM, Frankman EL, Tzfira T. pSAT RNA interference vectors: a modular series for multiple gene down-regulation in plants. Plant Physiol. December 2007, 145 (4): 1272–81. PMC 2151715. PMID 17766396. doi:10.1104/pp.107.106062. ^ Ruvkun G. Glimpses of a tiny RNA world. Science. 2001, 294 (5543): 797–99. PMID 11679654. doi:10.1126/science.1066315. ^ Fichou Y, Férec C. The potential of oligonucleotides for therapeutic applications. Trends in Biotechnology. 2006, 24 (12): 563–70. PMID 17045686. doi:10.1016/j.tibtech.2006.10.003.